↑ Shelton, Jim (July 1, 2013). "Peter Salovey takes the helm as Yale's 23rd president". New Haven Register. ശേഖരിച്ചത്: July 22, 2013. ↑ 4.0 4.1 "Yale Facts". Yale University. ശേഖരിച്ചത്: November 1, 2015. 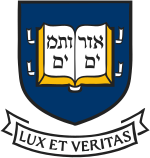 ↑ "Yale University – Identity Guidelines". ശേഖരിച്ചത്: 2017-04-19. ↑ Berkin, Carol; Miller, Christopher; Cherny, Robert; Gormly, James; Egerton, Douglas (2012). Making America: A History of the United States, Brief (6th ed.). Wadsworth. p. 79. ISBN 9781133317692. ഈ താൾ അവസാനം തിരുത്തപ്പെട്ടത്: 02:24, 15 സെപ്റ്റംബർ 2017.